Manchester United midfielder Anderson has been ruled out for the rest of the season after rupturing a cruciate ligament against West Ham. The Brazilian was injured after 19 minutes of Tuesday's 3-0 win, his first game for over a month. 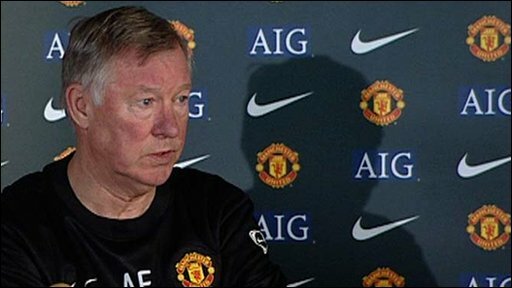 With the 21-year-old also set to miss the World Cup, United boss Sir Alex Ferguson said: "It is a bad blow." Winger Ryan Giggs, however, could face AC Milan in next month's Champions League tie following an arm fracture. The 36-year-old Welshman suffered the injury to his right arm on 10 February after colliding with Aston Villa's Steve Sidwell in the 1-1 draw at Villa Park. The veteran Sports Personality of the Year winner was sidelined for four weeks and could now feature against former team-mate David Beckham in the second leg against the Italian giants at Old Trafford. "Ryan still has the injury to the arm," said Ferguson. "But we are taking the plate out at the end of the week and he will be in full training after that, which is good news." Ferguson revealed he had also been considering Anderson, an £18m signing from Porto in 2007, as a starter in the return leg with AC Milan at Old Trafford on 10 March, when Michael Carrick will be suspended. But in only his 14th league appearance of this season, he was forced off the pitch in the first half of Tuesday's comfortable win over the Hammers and was replaced by Ji-Sung Park. "It's bad news for him," Ferguson added. "He was looking forward to coming back and had been showing great energy and enthusiasm." Following a scan on Wednesday, Anderson will head to Portugal in a fortnight for an operation to repair the ruptured cruciate ligament. His latest injury setback comes a month after being stretchered off during United's Carling Cup win over Derby on 20 January. "It is strange, when you see cruciate injuries it is usually something simple. He stretched out for the ball and his knee just popped," said Ferguson. "We have assessed the situation and know he needs the operation. Sometimes we have sent them to Dr Steadman in Colorado. In this instance he is comfortable with the surgeon he has dealt with in Portugal in the past. "He will be out for six months and hopefully that should have him about right for the new season." It was also revealed on Friday that centre-half Rio Ferdinand will miss next week's England friendly against Egypt because of a back injury. The new England captain had already been ruled out of Sunday's Carling Cup final at Wembley against Aston Villa because of the same injury.